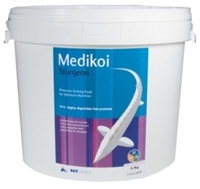 Medikoi Sturgeon is a highly digestible and nutritious sinking pellet Sturgeon food. It contains only the most digestible fish proteins, providing the correct proportions of vitamins, minerals and oils to ensure your sturgeon receive the best nutritionally balanced food available. 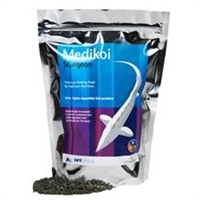 Other species of fish in your pond will also find Medikoi Sturgeon highly palatable. Recommended Feeding: Before feeding your sturgeon ensure the other fish have been fed with their usual food to prevent them from out competing the sturgeon for food before it reaches the bottom of the pond. This food stimulates excellent growth in all bottom feeding fish. The protein is highly digestible which allows your fish to utilise it more efficiently, keeping waste to a minimum and your pond water cleaner. Contains colour enhancers and high stabilised vitamin C.
A sinking food formulated specifically for sturgeon and sterlet. It contains only the most highly disetible proteins. It also provides the correct proportions of vitamins, minerals and oils to ensure your sturgeon receive the best nutritionally balanced food available.